Premise: A stranger hands a team of two contestants a briefcase which contains $100,000 in cash. 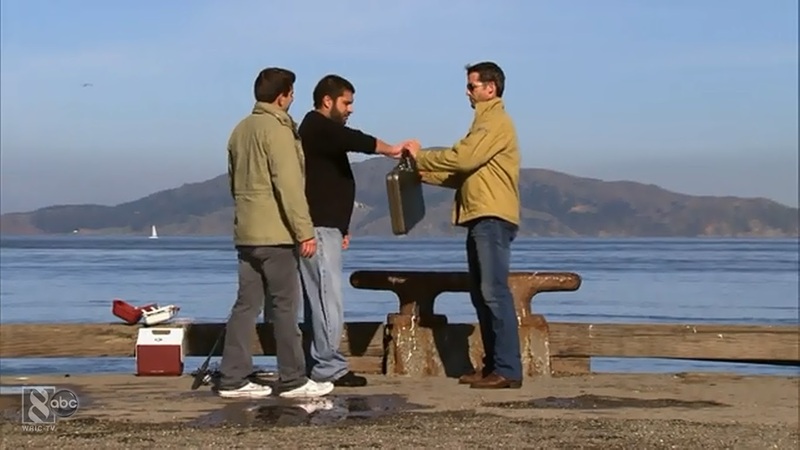 The team has one hour to hide the briefcase in a discreet location in their hometown. After their hour is up, two detectives will have 48 hours to find the hidden briefcase and the two contestants will be taken into custody by investigators to undergo a series of interrogation sessions during the two-day period. To aid them in their hunt, the detectives will be keeping track of the team’s cell phone records, GPS coordinates, and all receipts. The detectives will also be aided by interrogators Paul Bishop and Mary Hanlon-Stone, who will try their hardest to extract as much information as possible regarding the whereabouts of the briefcase. If the detectives can find the briefcase in 48 hours, they will split the $100,000 between themselves. Otherwise, the contestants will win the $100,000. Before I begin my review, I would like to point out that this will be one of the few times I will ever review a reality show since The Blog Is Right is dedicated to just traditional game shows. The reason why I am making an exception for this show is because Take The Money and Run is unlike any reality show I have seen today and one show that I was immediately impressed with from what I had seen from the previews a few weeks ago. Also, I removed the “play-along” factor from my rating of the show because this show has absolutely no play-along factor (nor does the show need it), and therefore the show would have not received the most fair and accurate overall rating with the inclusion of the Play-Along factor score of zero. There was a game show with a similar premise that aired on SyFy called Chase, but the show did not fare well as the series was cancelled after six episodes. Take The Money and Run shows what the short-lived show Chase should have done with their format. The show takes two ordinary people and puts them in a middle of a crime drama type scenario as they try their best to outwit, outplay, and outsmart the law enforcement. This show is for all the Law & Order fans who have ever dreamed and plotted on how they would formulate and execute their ultimate plan of hiding the $100,000 case. It is very interesting to see how the contestants handle being under pressure with every interrogation session they encountered and watching them sweat and seeing their master plan break down from time to time. Even though this is a reality show, the interrogators take their job seriously and do an excellent job at strategizing about how to handle and approach each contestant. Their skills definitely showed during the first episode as they were able to seek out the weaker brother of the two and put the spotlight on him to make him spill the beans about the briefcase location. I also like how the contestants are put in separate jail cells, completely separated from society, so the interrogators can employ the “Divide and Conquer” strategy with each team. However, this show is flawed in that the contestants are not as emotional and not taking the interrogation sessions as seriously as they would be if this was real life situation because of the fact that this is a television show. It even showed in the first episode as one of the contestants were laughing at and mocking the interrogators during one session, constantly reminding them that he and his brother were going to win the game in 24 hours. Overall, Take The Money and Run is perfect for the crime drama fans who have ever wanted to be in the middle of the action and excitement of a “Cops and Robbers” or “Cat and Mouse” game such as this one. The show has a good premise, but unrealistic given the fact that this is just another reality show. I am very interested to see which city the next show will take place and how the next team will fare in this interesting social experiment. Watch Take The Money and Run Tuesdays at 9:00pm EST on ABC!